I've been following Chasseur's Preussen build both on this forum and on MSW. 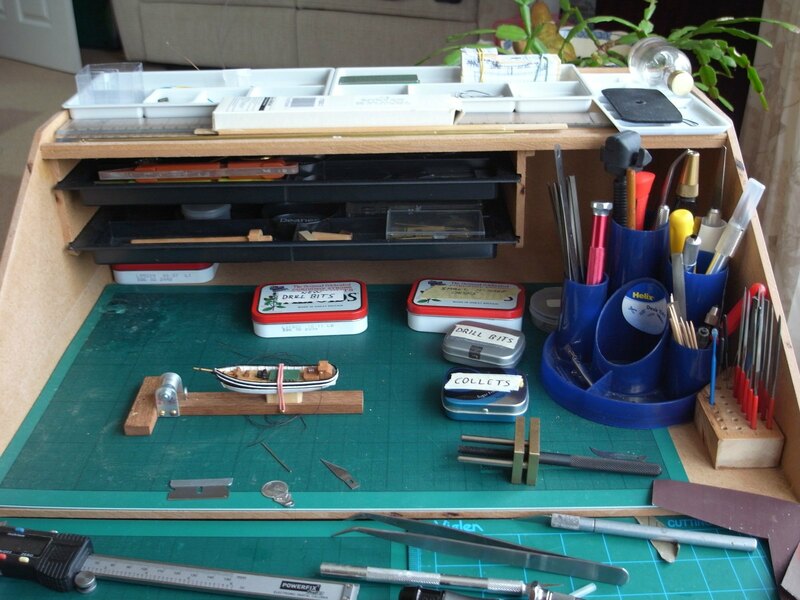 He has built himself a superb workstation, much like a jewler's bench. I've been working out of a selection of toolboxes and annexing whatever bits of the kitchen or dining room tables I could, but still had to move every thing when finished. So, inspired by Chasseur, I set about a small portable workstation. It's made from MDF, with 3 or 4 coats of MDF sealer. The two drawers are plastic desk drawer tidies, as are the small ones on the top shelf. A desktop pen holder and a bit of wood drilled for the files. I wonder how long it will be until I outgrow it. I like the desk. Looks like it would keep the tiny bits from flying away. I tend to work in chaos. I just build them on flat desk with some narrow shelves behind. I tidy it up every so often when it becomes too cluttered. Haven't done anything for weeks though, have lost interest to a great extent. Will probably start again when the weather improves. Don't like it when it gets dark at 4pm, but the situation is improving now with sunset at 4.36 pm. Thanks for posting. Now I can give my wife her sewing machine cabinet back.